Consider this a continuation from yesterdays post with the Ghirardelli Chocolates. 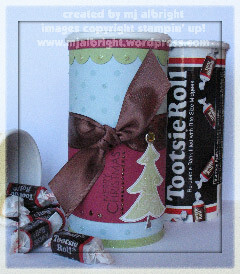 This Tootsie Roll container coordinates (and tomorrows post will coordinate as well). I’ve always wanted to alter one of these Tootsie Roll containers. So, I purchased a couple, altered one, and ate the rest…LOL! Yep, feelin’ a little stuffed today. Really cute and easy with a lot of bling. I used Crystal and Cinnamon Stickles (since them matched my color combo) all over this project. Went with this awesome non-traditional color combo again. I used Soft Sky Prints DSP as my base (all attached with Sticky Strip). 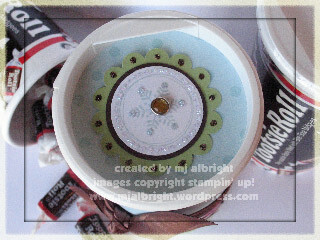 Next, stamped sentiment in Chocolate Chip ink, added Stickles, and attached to container. Can’t go wrong with ribbon, so I next added a strip of Chocolate Chip Satin Ribbon tied in a knot. Adhered stamped tree, applied some Stickles, and topped tree off with a yellow Fire Circle Rhinestone Brad. There is a 1/4″ piece of Certainly Celery CS to the bottom covered in Stickles. At the top, is a scalloped border created with my Slit Punch and added dry-embossed circles from my Crop-A-Dile. Topped this scalloped piece off with a 1/4″ piece of Purely Pomegranate CS. Colored some of the circles on the Soft Sky Prints DSP with Stickles as well. The top of the lid was created with Coluzzle (the 4th circle from the middle fits perfectly in the plastic lid). Scallop Punch to a piece of Certainly Celery CS. Punched a 1-3/8″ piece of Chocolate Chip CS. Stamped the snowflake with Soft Sky ink, added Stickles and a yellow Fire Circle Rhinestone Brad to coordinate with the tree. Also added Cinnamon Stickles to the scalloping. Adhered to lid. This is another quick and easy gift idea. It took about 45 minutes to make. Took about 15 minutes to eat all the extra Tootsie Rolls! Have a wonderful weekend! Off to work I go. CARDSTOCK USED: Purely Pomegranate, Whisper White, Certainly Celery, and Chocolate Chip CS; Soft Sky Prints DSP. 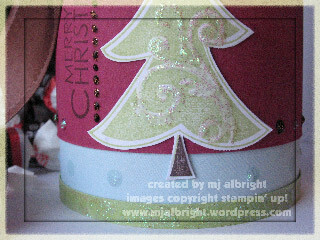 INKS USED: Certainly Celery, Soft Sky, and Chocolate Chip Classic Stampin’ Pads. ACCESSORIES USED: Stickles Crystal & Cinnamon; Fire Circle Rhinestone Brads; Coluzzle; 1-1/4″ & 1-3/8″ Circle Punches; Scallop Punch; Chocolate Chip Satin Ribbon; Slit Punch; Crop-A-Dile. Oh, yes! This is SOOOO me! LOVE this project! It makes me so happy just looking at it!! TFS! To cute!!!!! Thanks for sharing your inspirations. Cute cute!! That is soooo funny because I have been wanting to alter one of those forever too. I thought it would be cute to make a “retiring for golf” piggy bank or something of the sort for my dad. Where did you buy those…I can’t seem to find them now that I want them! LOL!! I love tootsie rolls too! I bet I could eat the rest in 13 minutes,:) Great project!! So cute! I just bought a holiday treat to alter too! Hope I can get it done soon!